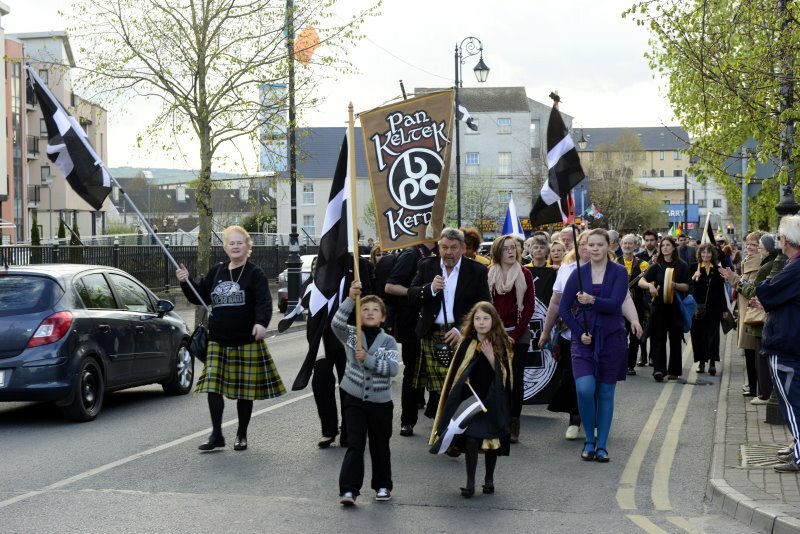 Last week the town of Carlow in Ireland was festooned in Celtic flags, placards, banners and bunting to welcome the arrival of the 41st International Pan Celtic Festival – and its many participants from Scotland, Ireland, Isle of Man, Wales Cornwall and Brittany. All available accommodation in the town had been snapped up months ago and some of our Cornish delegation, who had left it a little late to book in, found that the only remaining accommodation available was over nine miles away from the town ! Many of the shops in the town had decorated their windows on Celtic themes and there was a brilliant display of multi media artwork on Celtic themes done by the talented local school children in several of the town’s shops. The Official Opening Ceremony was honoured by a visit of the President of Ireland, Michael D. O Higgins, who gave a wonderful speech and declared the Festival open. He was scheduled to depart after the first half of the superb inter-Celtic concert which followed, but announced to loud cheers, that he had enjoyed the first half so much that he was going to stay till the end ! Next day saw the beginning of the inter-Celtic competitions with the Traditional Singing Competition for solos and groups and the solo section was won by Ireland and the group section by Scotland, and 18 year old singer/songwriter, Bénjad (Benjamin Larham) from Cornwall walked away with the 100 euro prize for the Best Newly Composed Song in Traditional Mode ! The Pan Celtic Song Contest was on the following night and the standard was very high but, once again Bénjad came out on top for Cornwall and collected the 1,500 euro prize for his song “Mordid Bewnans” (“Life’s Tide”)! Cornwall has won this competition in 2003, 2004, 2005 and now 2012 ! Not a bad record — four times in 10 years ! This was followed by the Manx/Breton/Cornish night, the Cornish section being done with some more songs from Bénjad and some great Cornish music and dancing from Cornwall’s Bolingey Troyl Band. Friday saw the Parade of Nations through Carlow with all of us in traditional costumes and waving our respective flags and dancing through the streets, along with several local marching bands and a pipe band and we were also joined by a lovely young group of Basque musicians and dancers, who happened to be visiting Carlow that week, which no doubt puzzled some of the purists, but it would have been rather rude not to have welcomed them to join in the parade ! This was followed by an excellent Welsh night of music singing and dancing. The dance competitions took place on the Saturday morning and while the Bolingey Troyl Band and dancers put on a very good performance, they didn’t win a prize in that competition. They had been dancing in the streets of Carlow all week and flying the flag for Cornwall and I heard several people complimenting them on how much they had enjoyed these performances. Meantime our musicians also flew the flag in a big way for Cornwall by getting several sessions of Cornish music going in various local pubs and as well as the Bolingey Troyl musicians, we also some great music from Raymond Delf from Padstow, Paul Trevenna, currently living in exile in Gloucestershire, and Roger Harrison, who now resides in Galway city ! 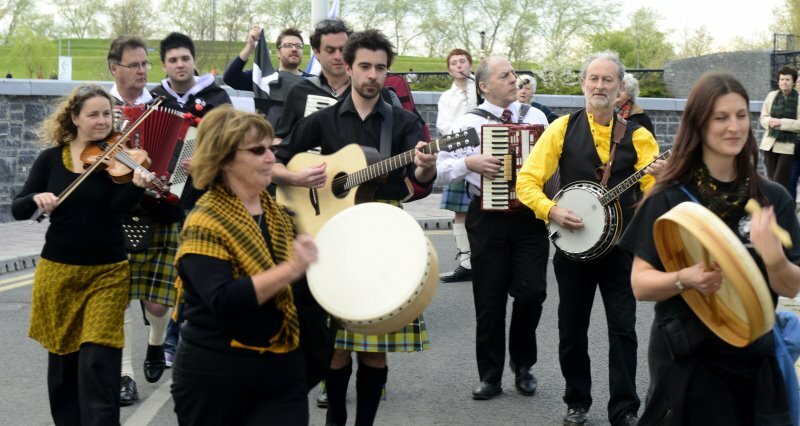 We were joined, as usual, by the Manx for several of our informal sessions, as these two nations nearly always hang out together at the various Celtic festivals which we attend. The Pan Celtic Festival Committee and the people of Carlow gave us a huge welcome and the Carlow Town Council also laid on a lovely civic reception for us and we all had a great time. 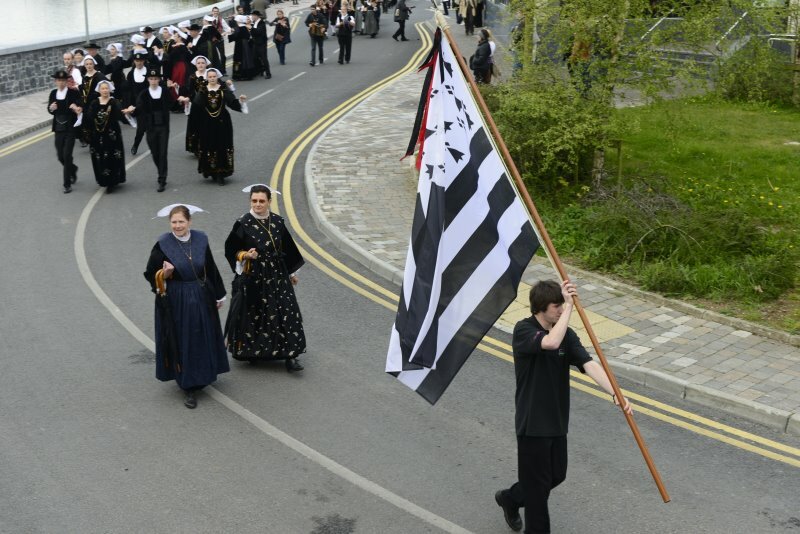 We are very proud that Cornwall did so well this year and are already happily looking forward to our next visit to Carlow in early April 2013.